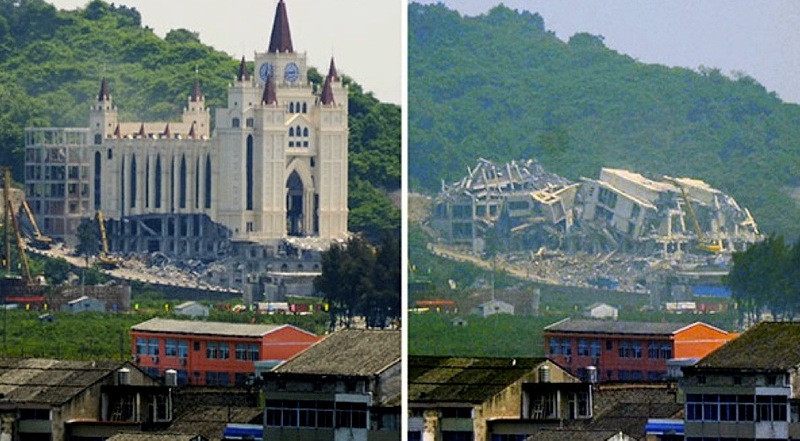 The demolition of this towering Protestant cathedral (below) on the outskirts of the coastal Chinese city of Wenzhou on April 28, 2014 marked the launch of a government campaign to curtail the fastest-growing religion in nominally atheist China. There are now about 100 million Christians in the world’s most populous nation, eclipsing the 86.7 million-strong membership of the ruling Communist party. According to western intellectual tradition, modernity is supposed to bring secularization but in modern Communist China it has been accompanied by an extraordinary rise of religions formerly banned as “opiates of the masses”. The demolition of the Sanjiang church in Wenzhou marked the start of a state campaign to rein in the rise of Christianity. This has included harassment, detentions, removing crosses and destroying churches in Wenzhou and throughout Zhejiang Province. Photo at left shows the church on April 28 2014 and at right, the day after. Surprisingly, given its status as a “foreign” religion, Christianity (particularly the Protestant and Pentecostal variety) has been the big winner in the competition for Chinese souls. If it continues to spread at its current pace, the country is very likely to be home to the world’s largest Christian population within the next 15 years. For China’s authoritarian leaders, who despise and fear any force not under their direct control, this seemingly unstoppable trend is very disturbing. 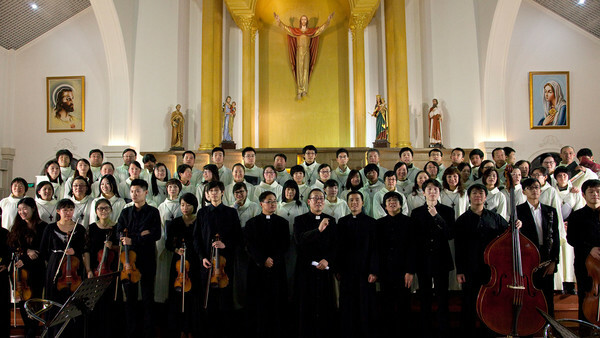 Christmas concert at St Peter’s Catholic church, Shanghai. Chinese Catholics are only permitted to attend churches controlled by the Chinese Patriotic Catholic Association, which answers directly to the Communist party and does not recognize the Pope.